Whilst my firm were carrying out work on part of the Vokin’s shop in East Street some years ago, a large amount of price lists fell out of a stairwell where they had lodged many years ago. As they were being thrown out with the general rubbish I decided to rescue one from the skip. Does anyone know anything about John Hamlin and his business? If you can help, please leave a comment below. Please click on the photograph to open a large version in a new window. 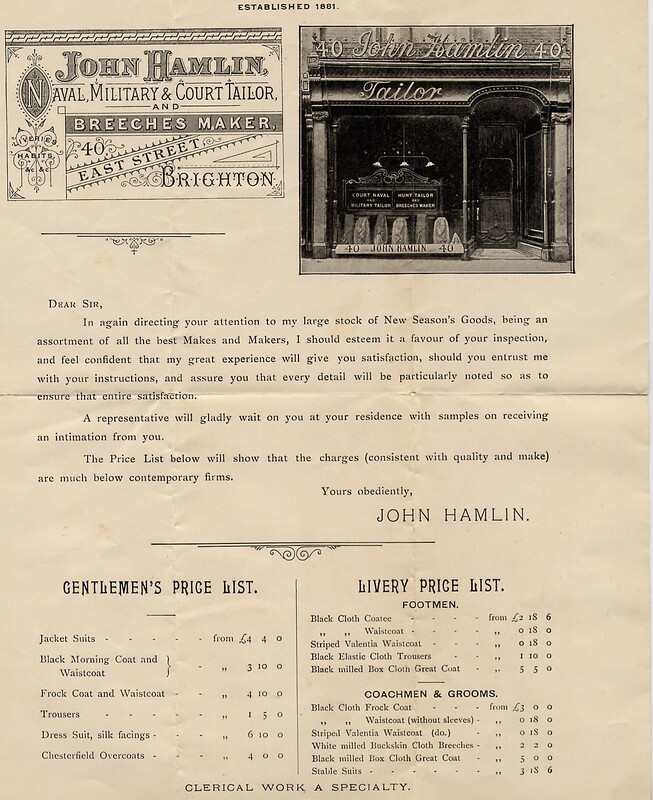 Hi Alan, John Thomas HAMLIN was born in Brighton at the end of 1848 and was the son of an established tailor, Frederick HAMLIN. It is likely he served his apprenticeship with his father and then worked for him in his North Street shop, setting up his own business in 1881 at 40, East Street. By the end of the century he had additional premises at Bicton House, Preston Street. The business ceased trading around 1916. Regards, Andy.